"Changing the World, One Life at a Time..."
Refugee/Immigrant Young-Adult Neighbor (RYAN) is a 501(c)(3) charitable organization with the stated goal that all newcomers in our communities are welcomed with open arms. In years past, immigrant and refugee families took several generations to fully integrate into society. To this day, first generation newcomers still face many obstacles and hardships, leading to feelings of frustration, loneliness, and even helplessness. We, at Refugee/Immigrant Young-Adult Neighbor (RYAN), find this unacceptable, and thus we are called to intervene in the first generation, specifically with young adults. Our purpose is to bring together young-adult refugees/immigrants with students at nearby colleges and universities to stimulate genuine friendships, while opening the door to higher education, and providing hope for the future. The concepts underpinning RYAN stem from the volunteer experiences of founder and executive director, Ken Chester, dating from 2007, when he was a volunteer with an MSU student organization which brought together domestic and international students for volunteer service in a multicultural context. In the fall of 2007, the group collaborated with local refugee agencies as one of the student organization’s service projects. Toward the end of the project, upon entering the home of one Burundian family, their eldest son, who had learned to speak English in a refugee camp high school, gave a tour of the household. He was thinking about college, but wasn’t sure if there would be any opportunity, or if he would qualify. After a few days, Ken contacted Lansing Community College and sent him a letter regarding admissions, financial aid, and the possibility of eventual transfer to MSU or other universities. This individual eventually enrolled at LCC and later said that Ken was his first and only friend in America. RYAN was founded on exactly these two ideals: educational mentoring and genuine friendships for young-adult refugees and immigrants. Though we have only recently broadened our impact by receiving our federal non-profit 501(c)(3) determination in February 2011, we already have an established track record from our time as a registered student organization at Michigan State University. During the 2009-2010 academic year, for instance, we piloted what has become our Peer-to-Peer Mentoring Initiative. 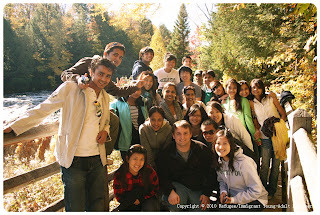 During this time, we have 1) organized events to promote networking between young-adult refugees/immigrants and students at Michigan State University; 2) coordinated visits to college resource fairs, cultural performances, student organization meetings and; 3) established links between MSU registered student organizations (RSOs) and local refugee and immigrant communities. Specifically, our RYAN 'graduates' have commenced degree programs at each of Lansing’s three local post-secondary institutions: Lansing Community College, Great Lakes Christian College, and Michigan State University. One Bhutanese refugee, whom RYAN assisted in gaining undergraduate transfer admission to MSU in 2009, has recently graduated within the class of 2011!